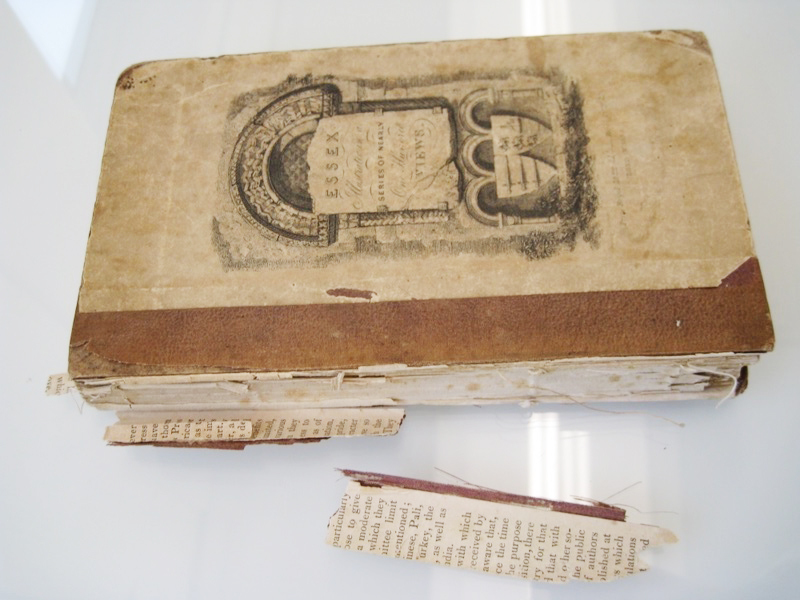 What does an archive do when faced with a book being torn apart by its own binding? 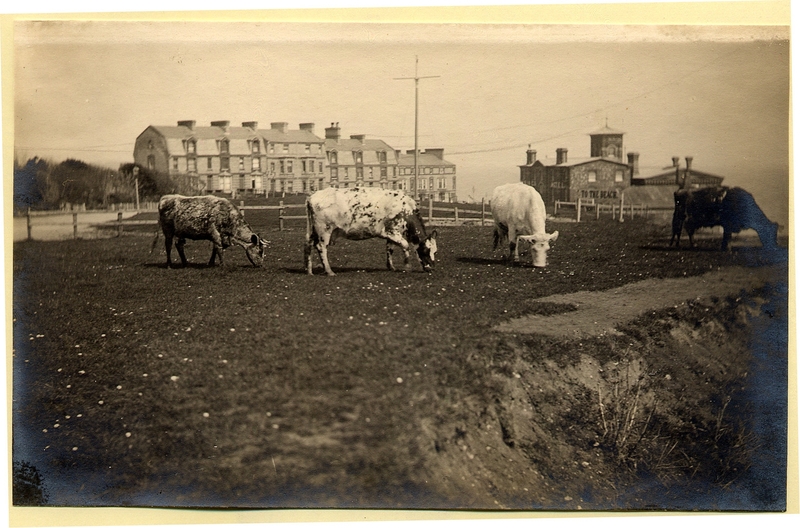 Our Senior Conservator Tony King blogs for us about conserving Essex Illustrated. 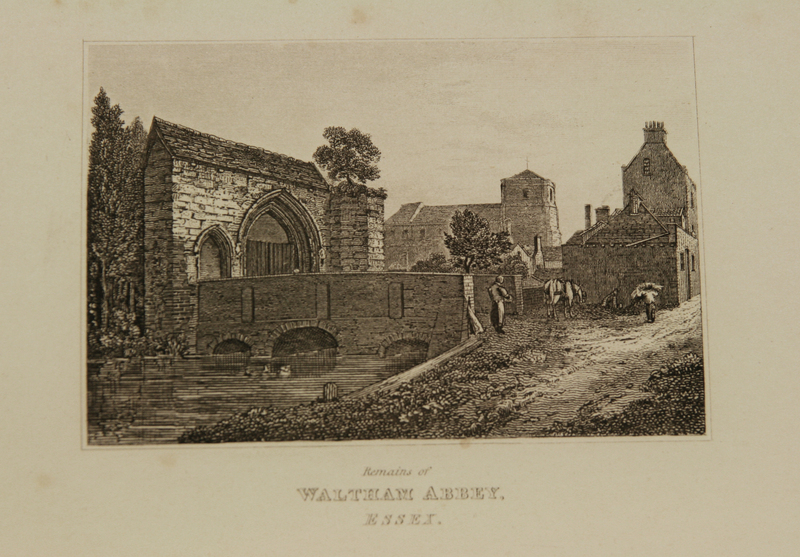 In February-March 2012 the Conservation Section at the ERO worked to conserve Essex Illustrated in a Series of Nearly 100 Views, a book of 94 prints dating from 1834. 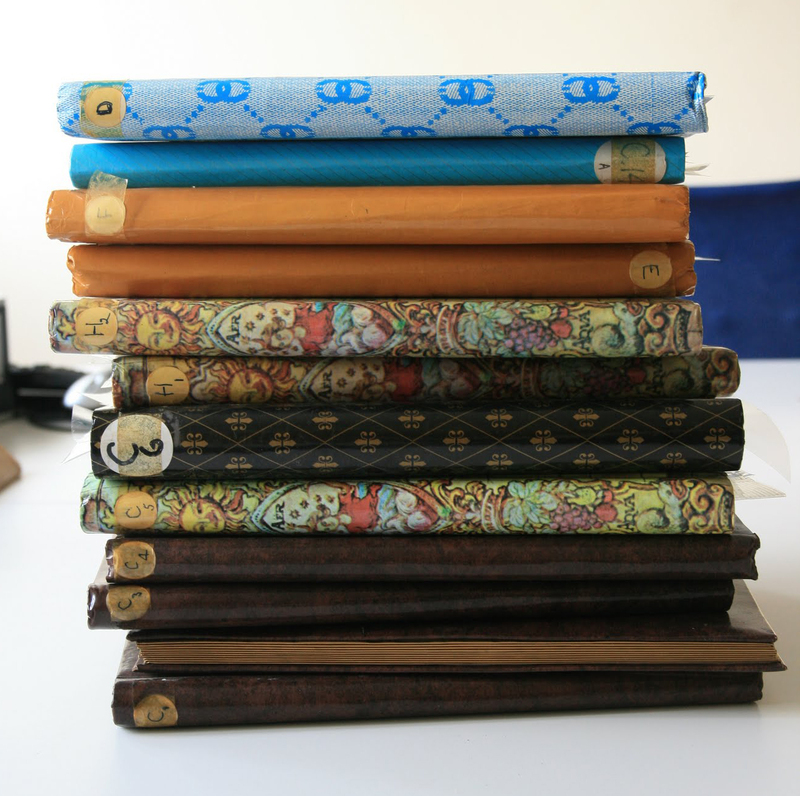 It was in a very poor condition due to the original style of binding and the quality of the materials used during the binding process. 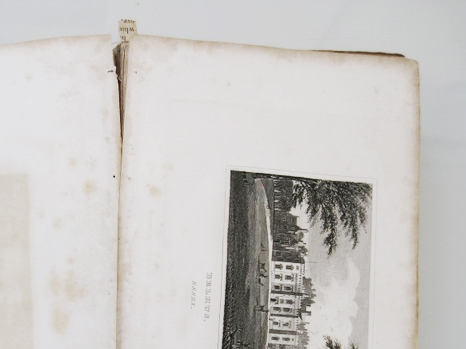 This book presented a real challenge; conservation practice is to preserve as much of the original binding as possible and only to rebind a book as a last resort. This is because it is not just the content of a book which can tell us about the past, but the physical object of the book as well. This book was bound quickly and cheaply, which tells us something about the intended audience and use of the book. 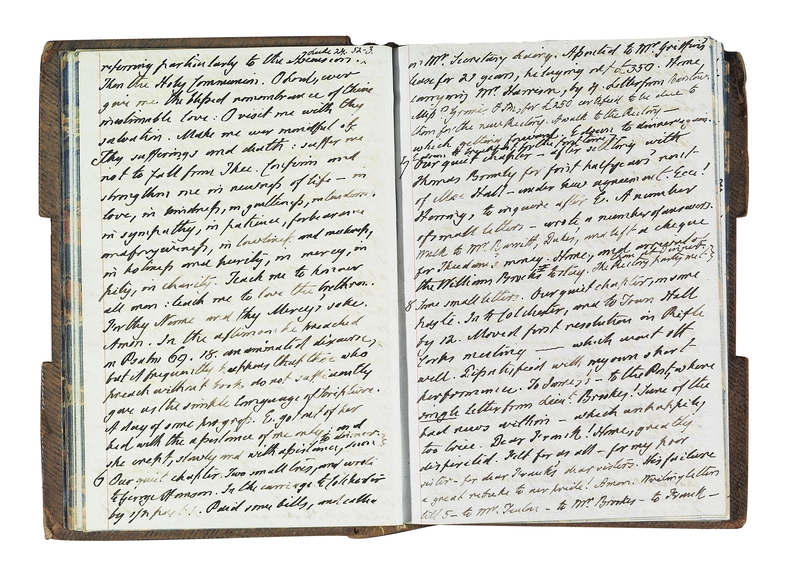 Perhaps it was given a cheap binding as the buyer was expected to remove the prints and frame them or put them in a scrap book, and to put what would have been considered an expensive binding on it would alter the nature of the book and the information that can be inferred from its presentation. Yet to reconstruct the style of binding originally used would seem foolish as it had completely failed; however, to alter the style to a more robust one would not be in-keeping with the historical integrity of the item. 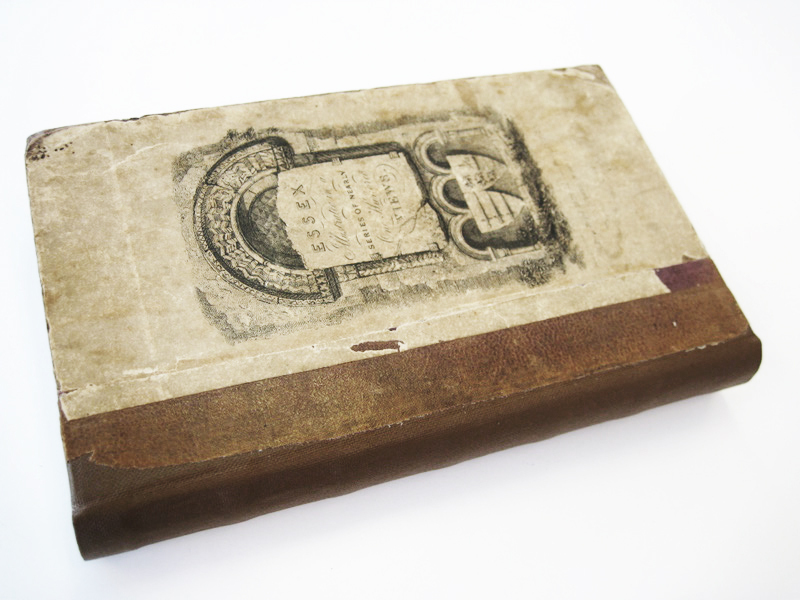 We needed, therefore, to devise a method which would reuse every part of the original binding and preserve the appearance of the book as much as possible whilst creating a strong volume so it could be used by researchers. The first step was to find out how the book had been bound originally. 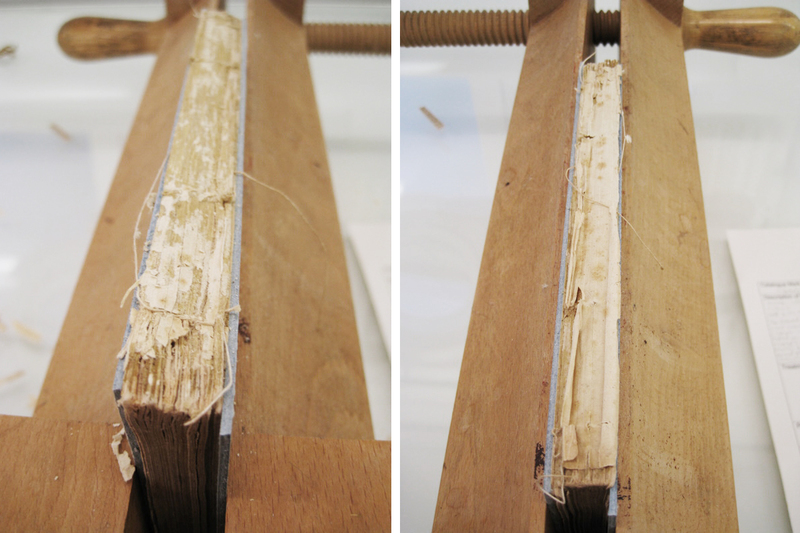 In order to do this, the pages were clamped into a finishing press with the binding removed. This revealed that the book was made from single sheets of paper that had been oversewn, a sewing style where the stitches are passed through the sheet of paper near the spine edge rather than through the centre of a fold as is more common. Oversewing had been used as there were no folds to sew through as each page was a separate sheet of paper rather than a folded section and it offered the fastest method for sewing the book. 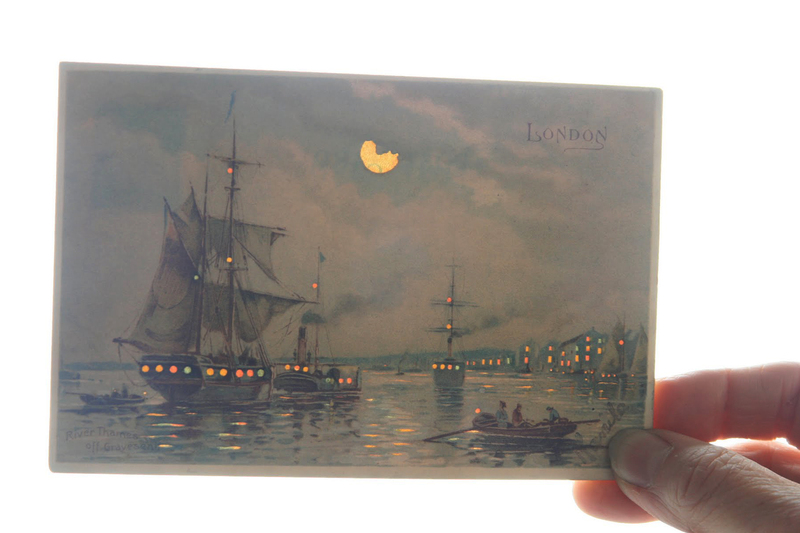 This choice of sewing style made by the original binder was the cause of many of the problems the book now presented. The thick paper used for the prints was restrained by the sewing going through the page and the pages were too stiff to lay flat and articulate properly when the book was opened. 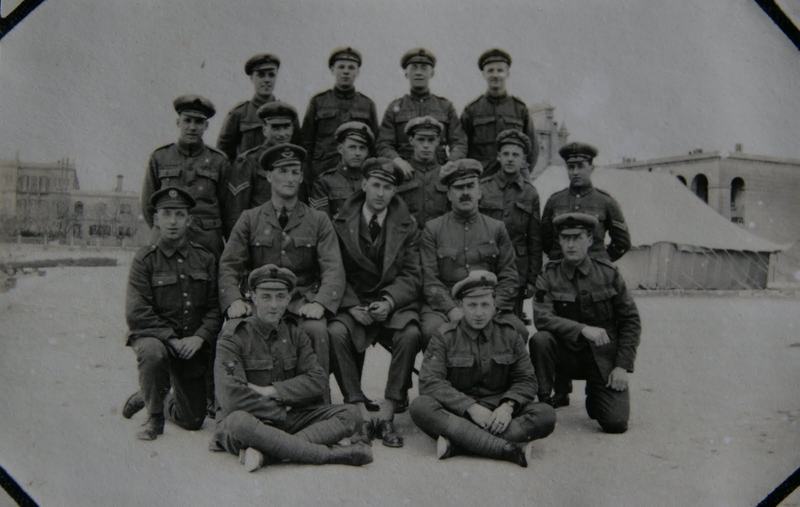 This resulted in stress being placed on the pages, causing the paper to tear around the sewing holes and pages to become damaged and loose. 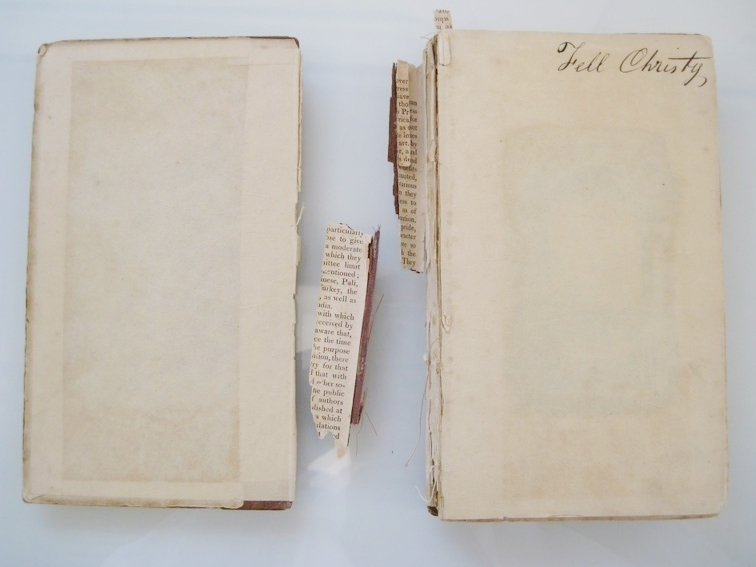 Furthermore, the style of binding (case bound) combined with the poor quality materials had resulted in a very weak binding with little strength at the point where the boards attached to the book and both boards had torn away and were completely detached. 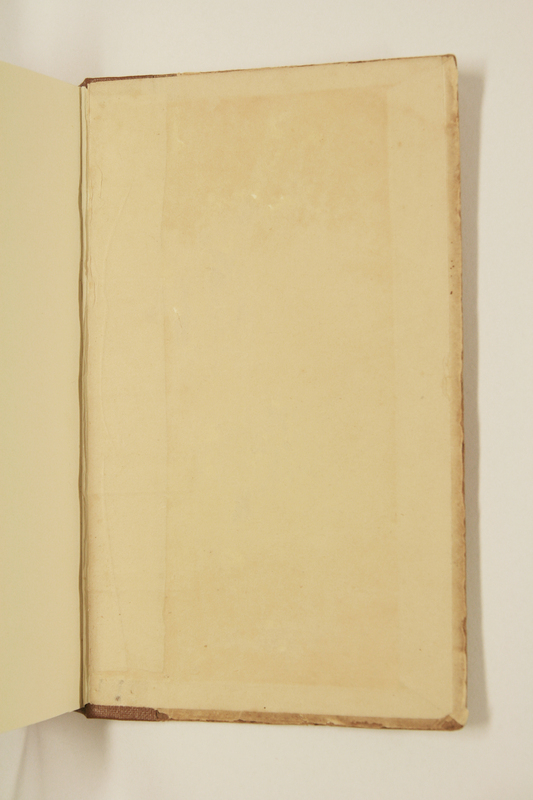 After washing and deacidifying (treatment of acid present in the paper with an alkaline chemical) each print was adhered at the spine edge to a sheet of thin acid free paper which was then folded around the face of the print to form a folded sheet with a central crease which could be sewn through. 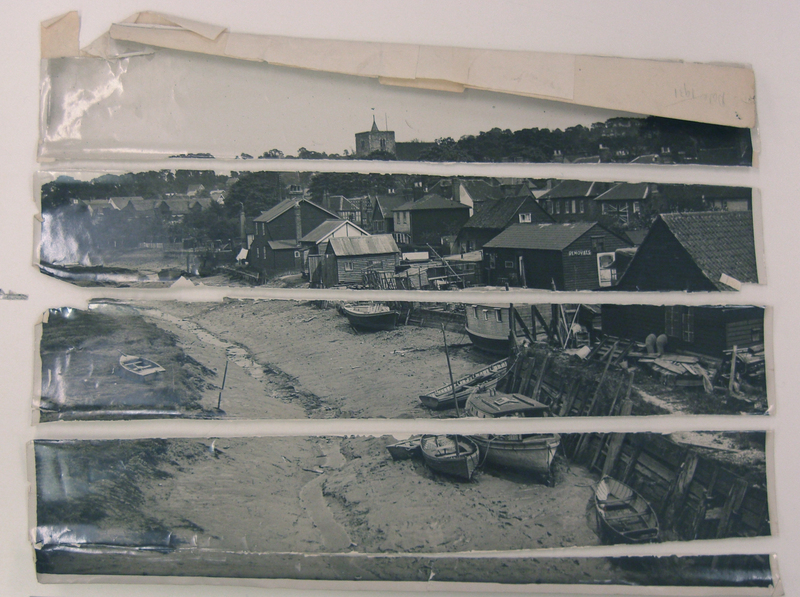 These thin sections were sewn together using 5 linen tapes as support which would then be attached to the boards and act as a hinge. 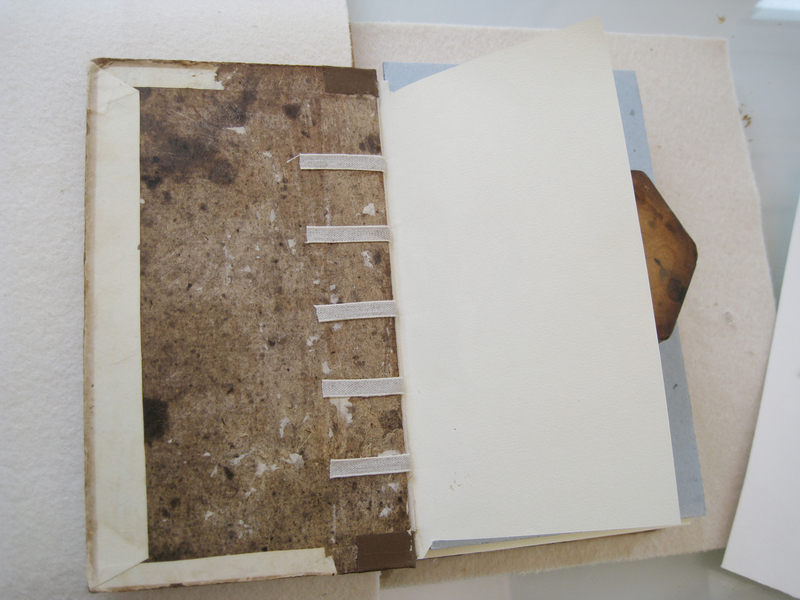 Once sewn, the original boards were reattached by pasting the ends of the linen tapes down underneath the original pastedown, thereby obscuring the new additions to the binding structure. New book cloth was required to replace the partial loss of the original and the bridge the gap created by the increased thickness of the volume. 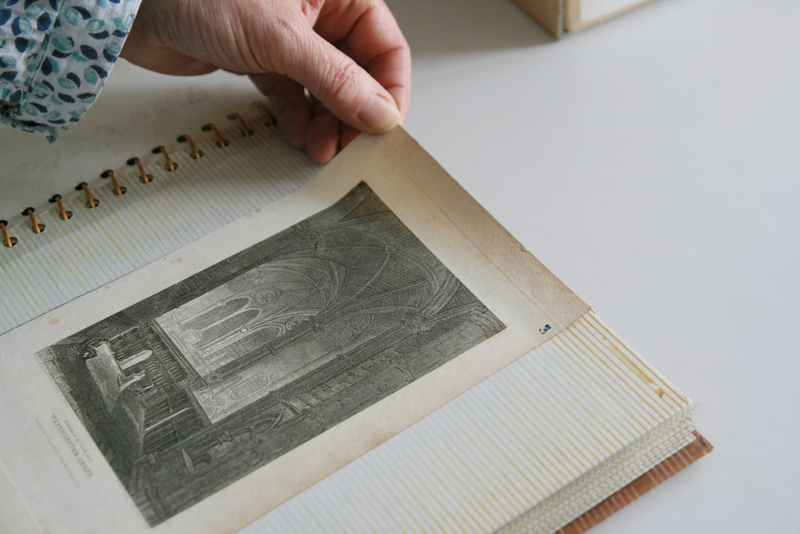 The conservation work has been carried out without replacing any of the original material or drastically altering the appearance or mechanics of the structure, and following treatment the book is now strong enough to be handled by researchers, without the risk of damage to the binding or the prints inside. 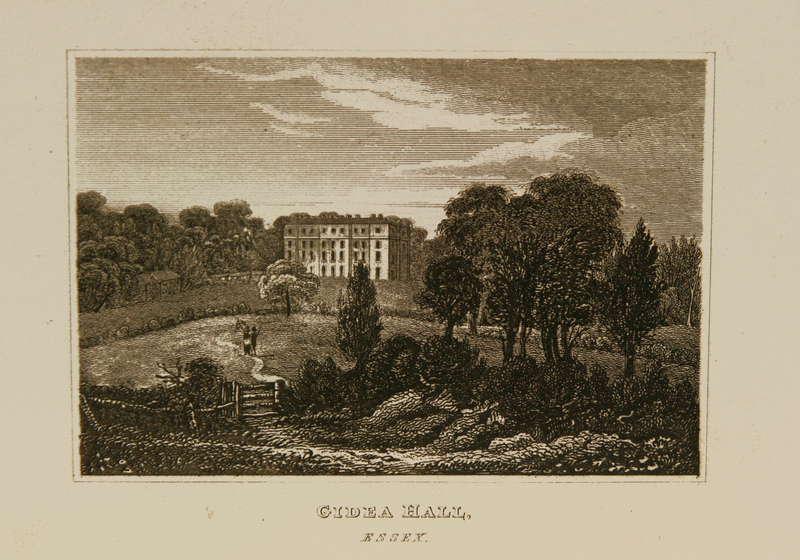 You can see Essex Illustrated for yourself by ordering it in the Searchroom, using the reference LIB/REF 2. Where are you planning your summer holiday this year? 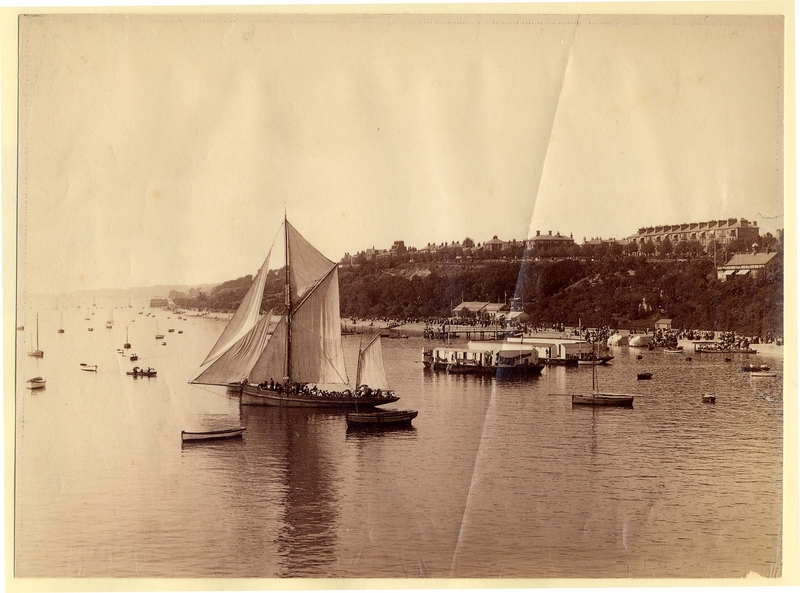 Essex is possibly not the first place you would think of, but in the nineteenth and early twentieth centuries, Essex’s ‘Sunshine Coast’ was one of the destinations of choice for the discerning British holiday maker. The historians of the Victoria County History of Essex have been hard at work over the last few years researching the pasts of Clacton, Walton and Frinton, and their research has now been published as volume 11 in the Victoria County History of Essex series. 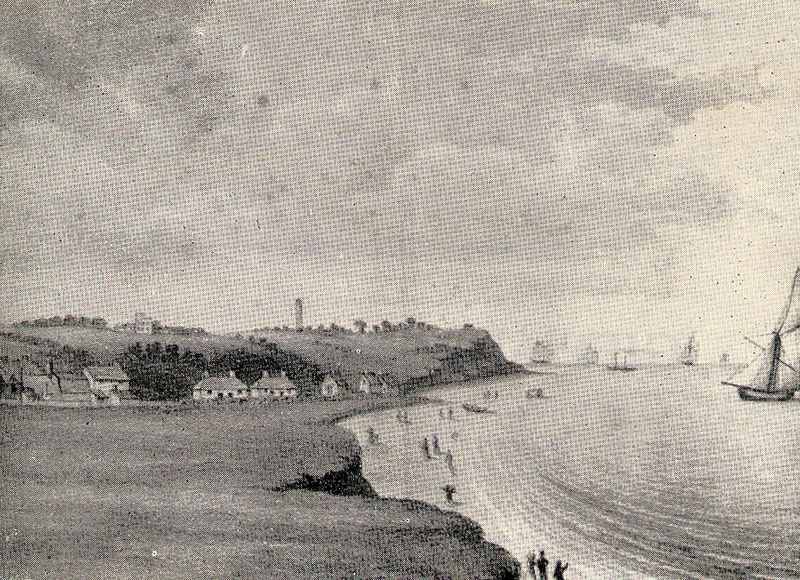 From the 1820s, Walton and later Clacton and Frinton were promoted as high-class residential and holiday resorts. 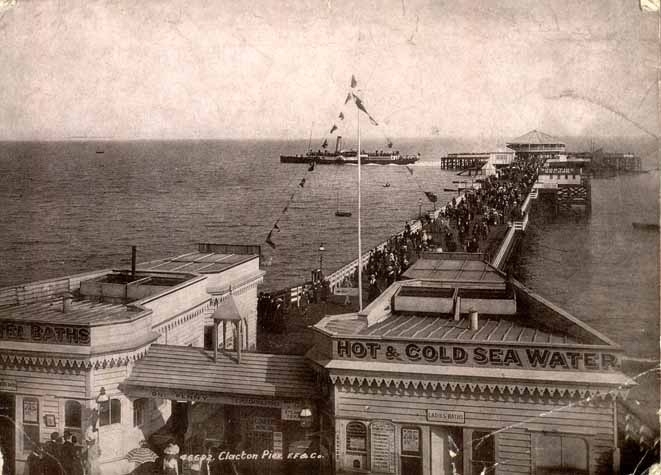 After a slow start, hampered by poor communications and low demand, growth was stimulated by steam ship companies which landed visitors on newly built piers in Walton and Clacton and by the railways that reached Walton in 1867, Clacton in 1882 and Frinton in 1888. 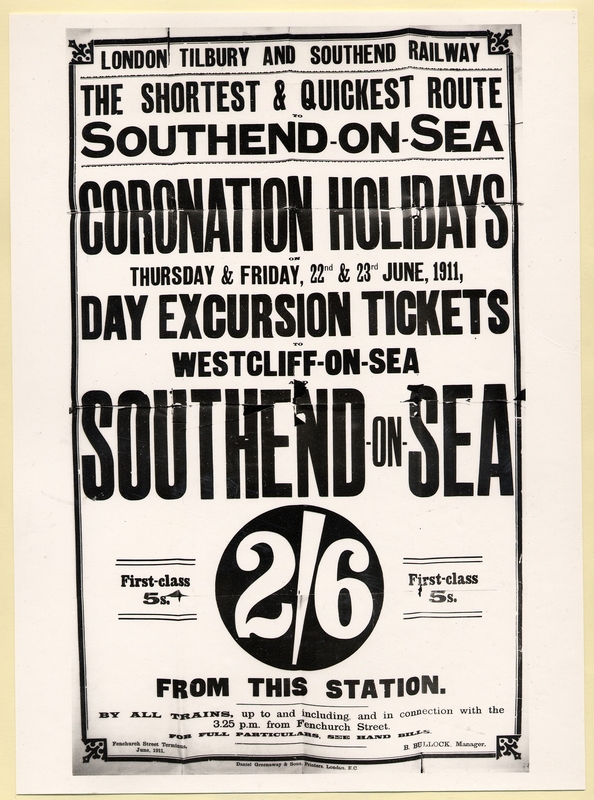 However, the working-class excursionists newly attracted to Clacton, and to a lesser extent Walton, then irrevocably changed the social tone of both resorts. 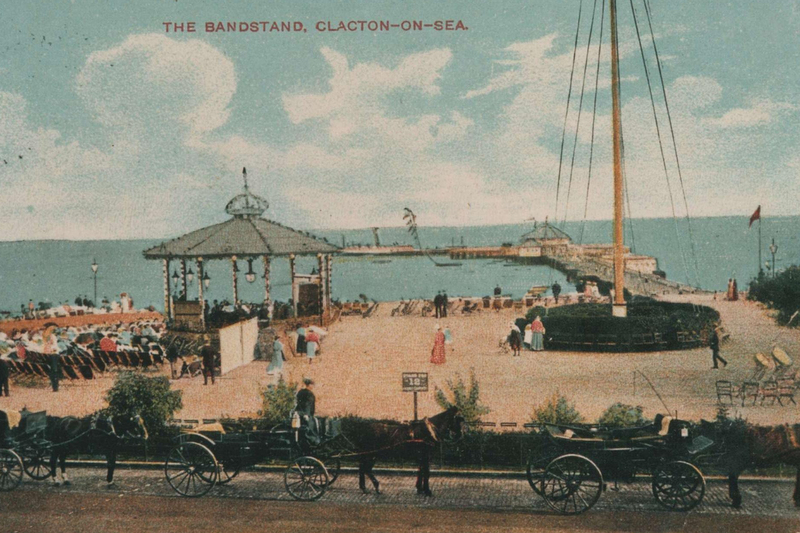 By the 1920s and 1930s Clacton had become a highly commercialized holiday destination and its pier’s funfair-style facilities rivalled those of any other British resort. Nearby Jaywick was established as a cheap and cheerful plotland development and Butlins opened its popular Clacton holiday camp in 1938. 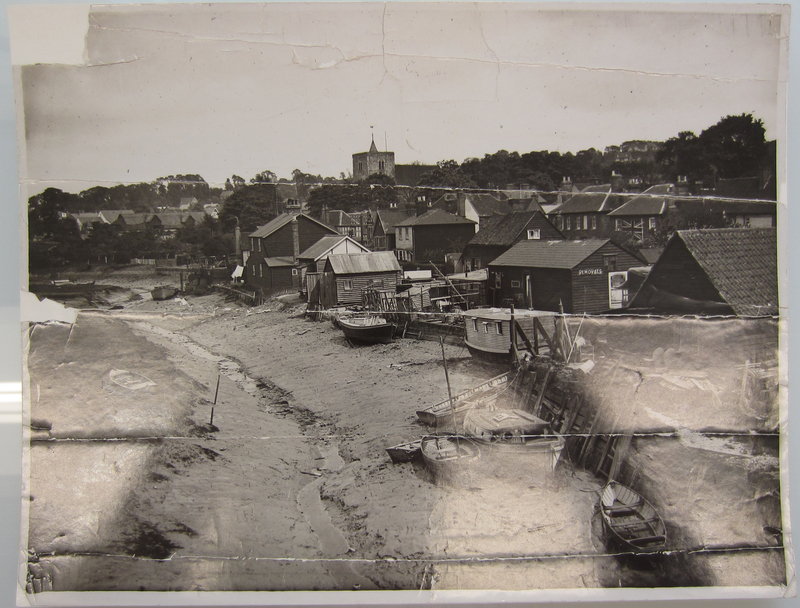 While Walton remained popular with families, Frinton continued as a ‘select’ resort, with building development and commerce strictly controlled to protect its exclusive character. After 1945 camping and caravanning increased in popularity, but from the later 1960s the growth of overseas holidays led to a steep decline in the domestic tourism economy. The coast remained popular for retirement and subsequent diversification has led to large dormitory-style housing developments, light industry and shopping centres. 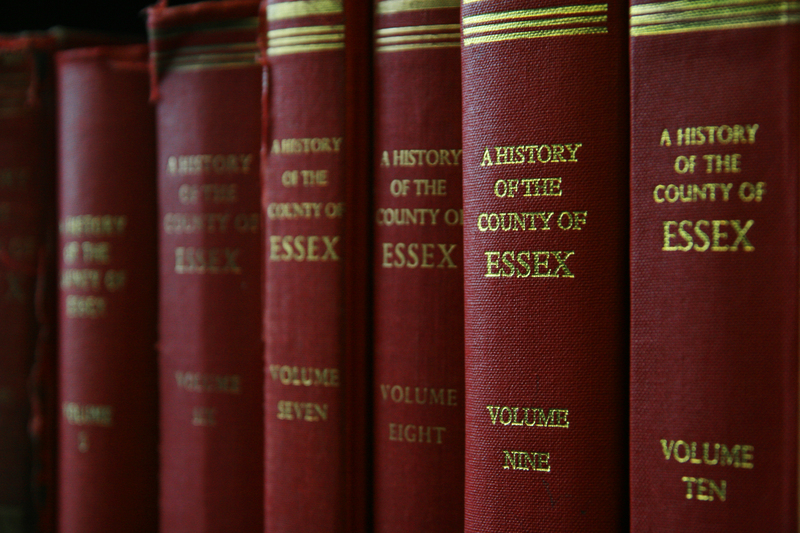 The volume which tells this story is part of a grand tradition: the distinctive big red volumes of the Victoria County Histories have graced the shelves of archives and libraries across England since 1900. 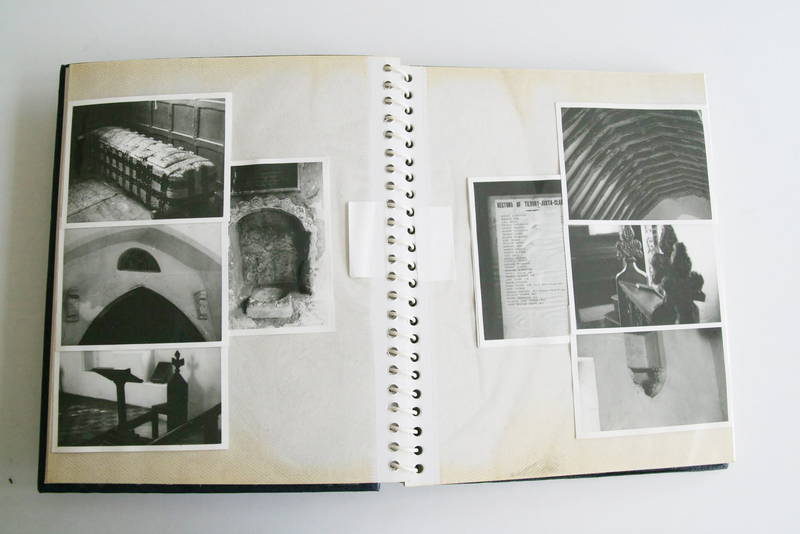 Founded in 1899 and dedicated to QueenVictoria, the Histories aim to produce ‘an encyclopaedic record of England’s places and people from earliest times to the present day’. 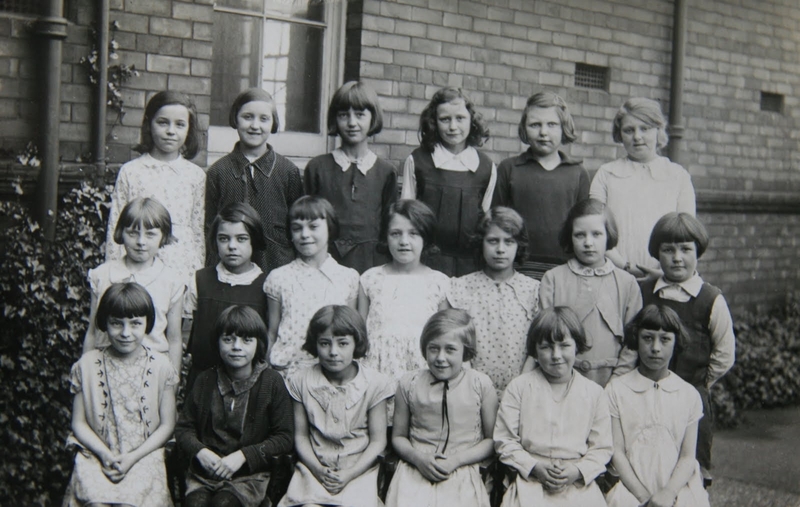 The Histories are still being written by historians working in counties right acrossEngland, and the Essex Record Office is home to the Essex VCH Trust. 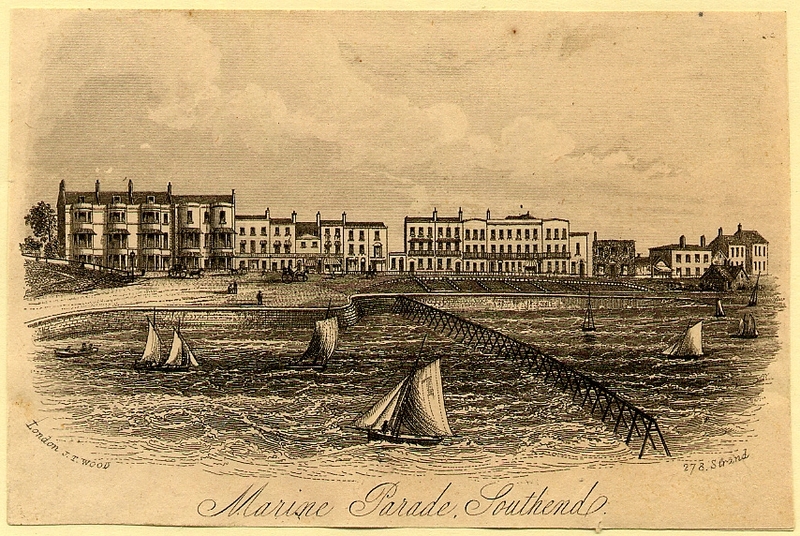 Volume 11 of the Victoria County History of Essex, Clacton, Walton and Frinton: North-East Essex Seaside Resorts, will be available in the ERO Searchroom shortly, and can be ordered from Boydell & Brewer Ltd here. 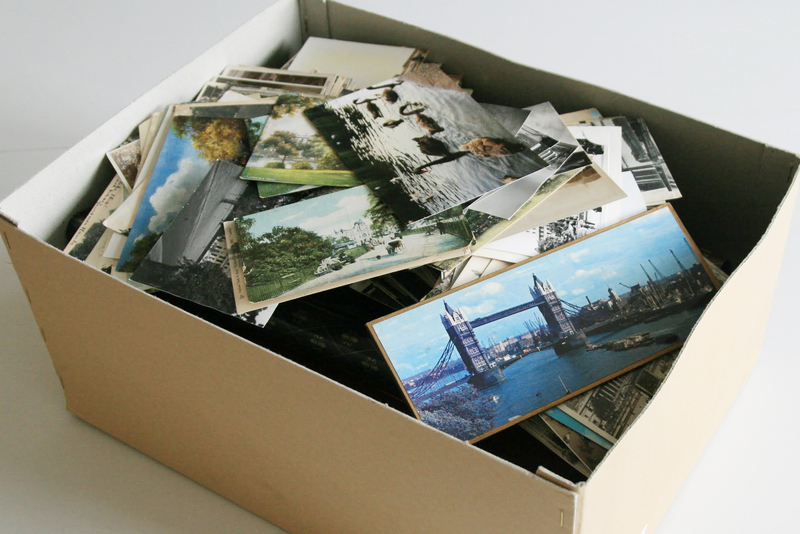 Do you have family photographs stashed away in a shoebox in the attic? 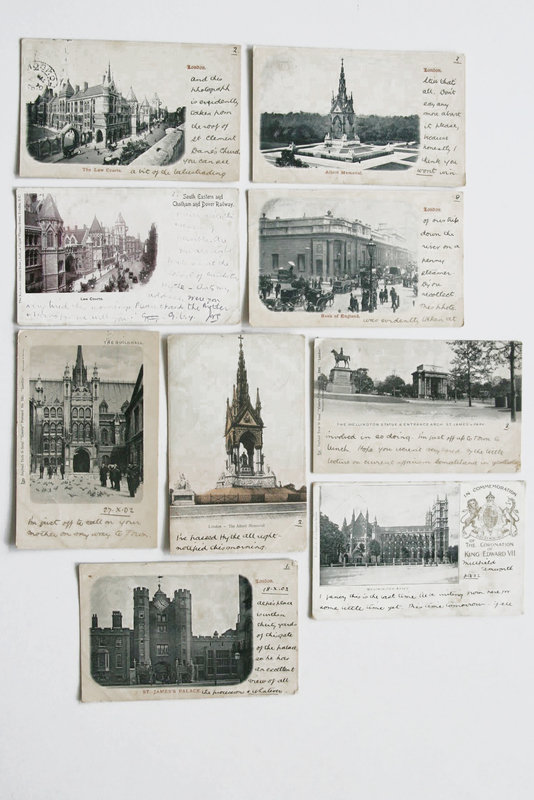 Or perhaps letters, diaries, war records or newspaper cuttings relating to your ancestors? 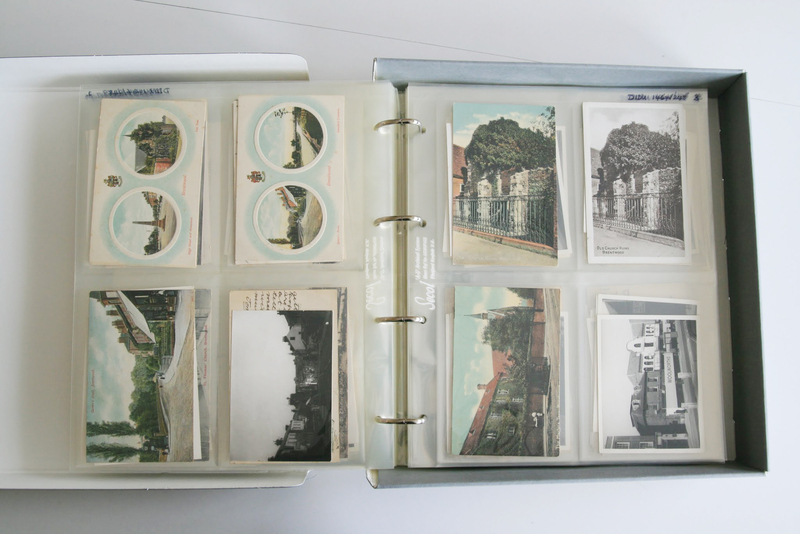 These documents and pictures help to tell your family’s story, and are irreplaceable. Many things, however, can threaten their survival. Quite apart from the risks of loss and wear and tear, there are the invisible threats that storage in envelopes, boxes and albums can bring. Over time, acid contained within ordinary paper and cardboard will eat away at the documents stored inside. 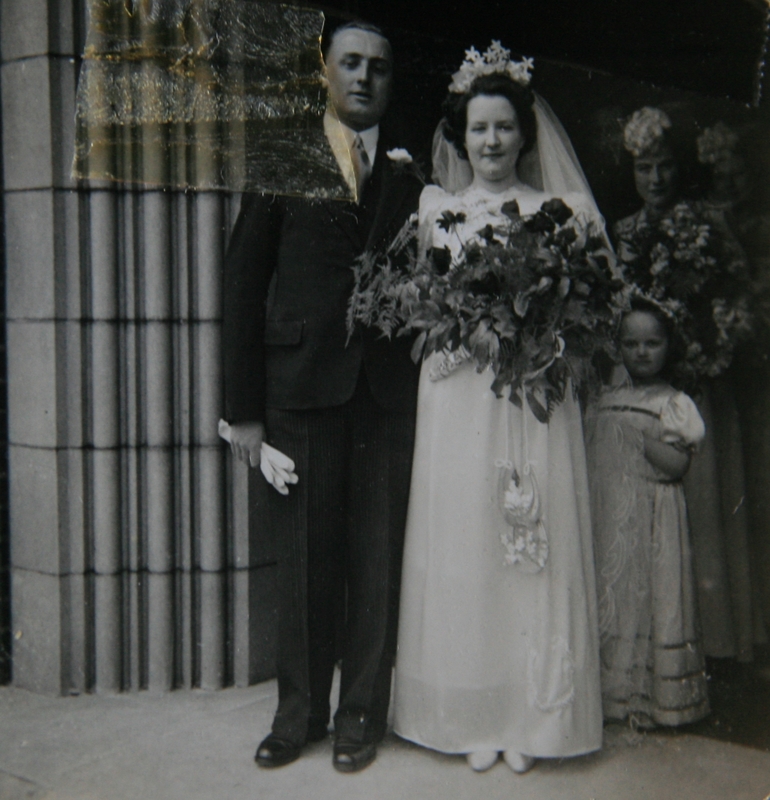 This wedding photograph from 1945 has had sellotape applied to it – one of the worst things you can do to an historic photograph or document! Stored and cared for properly, however, documents like this can last for generations. To help you keep your documents and photoraphs in the best condition possible the ERO is hosting two Conservation Surgeries. 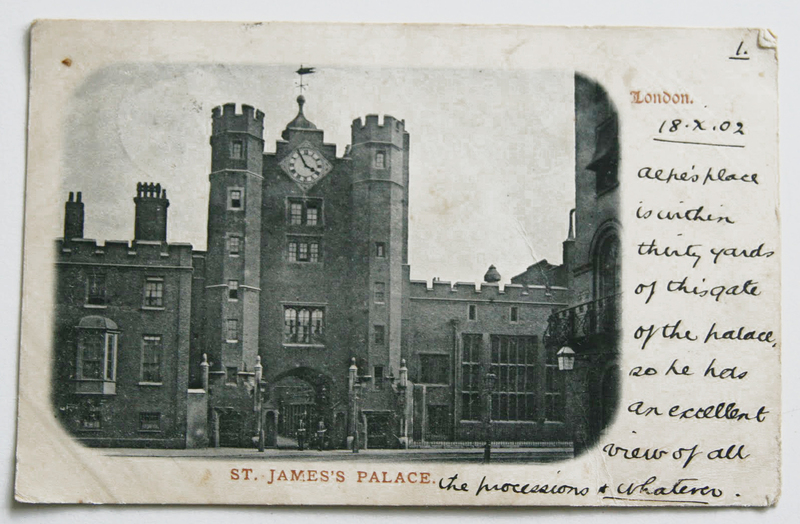 Come along to these free drop-in sessions and bring your documents for expert advice from our Senior Conservator on how best to care for your documents and photographs. Conservation is a vital part of our work at ERO. 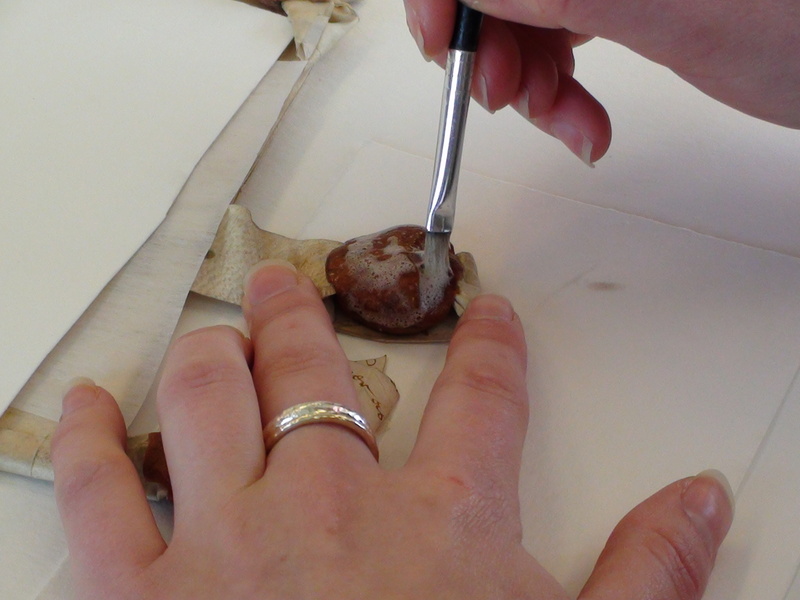 Our conservators work to protect and conserve documents, to ensure their survival for years to come. 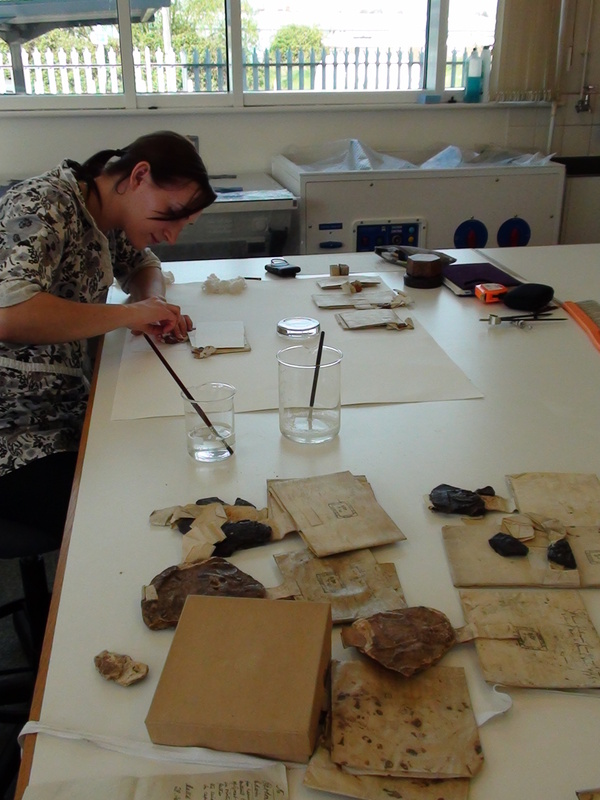 One recent project has conserved a collection of 42 early medieval deeds relating to the manor of Colchester Hall in Takeley (document references D/DRu T1/1-42). 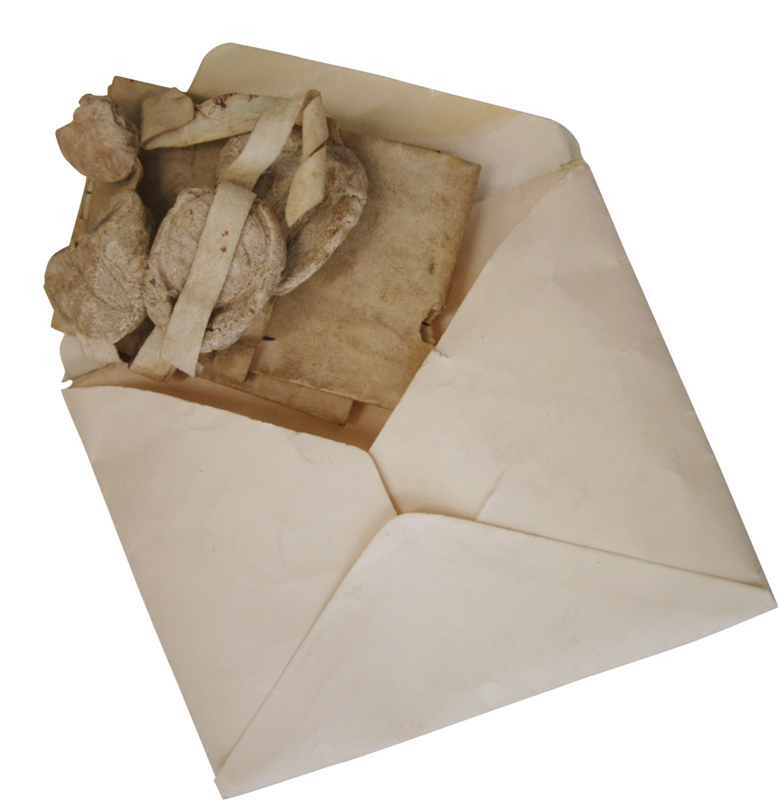 These deeds are special for many reasons; they all date to before 1250, many have intact seals, and notes made in Arabic numerals on the back of the deeds are an early example of the use of this numbering system in England. 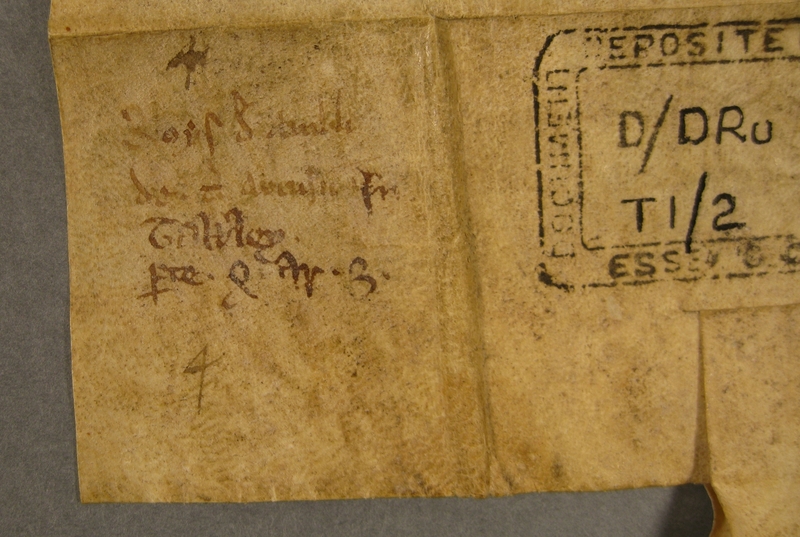 In the last line of this note, it is possible to make out an 8 and a 3 – an early example of the use of Arabic numerals in England. The 4 is from a later cataloguing system. 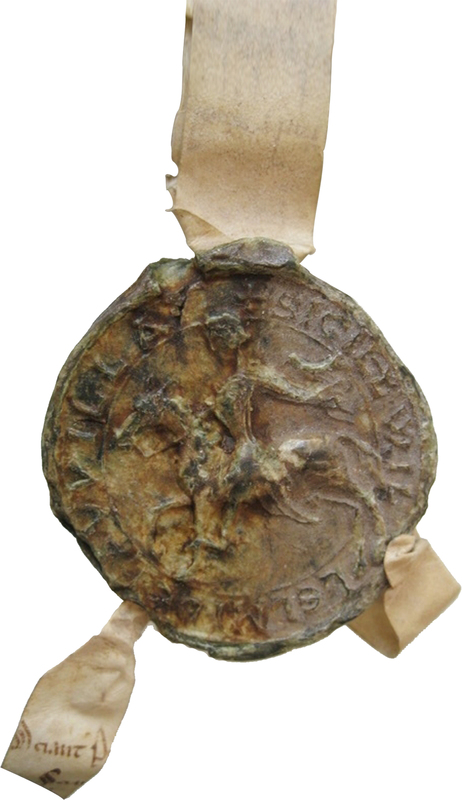 Unusually for such early deeds, over half still have their original seals attached, and the cleaning has made it possible to pick out detail on the seals which had been lost beneath accumulated dirt. Tears in the parchment have been repaired using patches of goldbeater’s skin (a membrane made from calves intestine), applied with a gelatine adhesive. 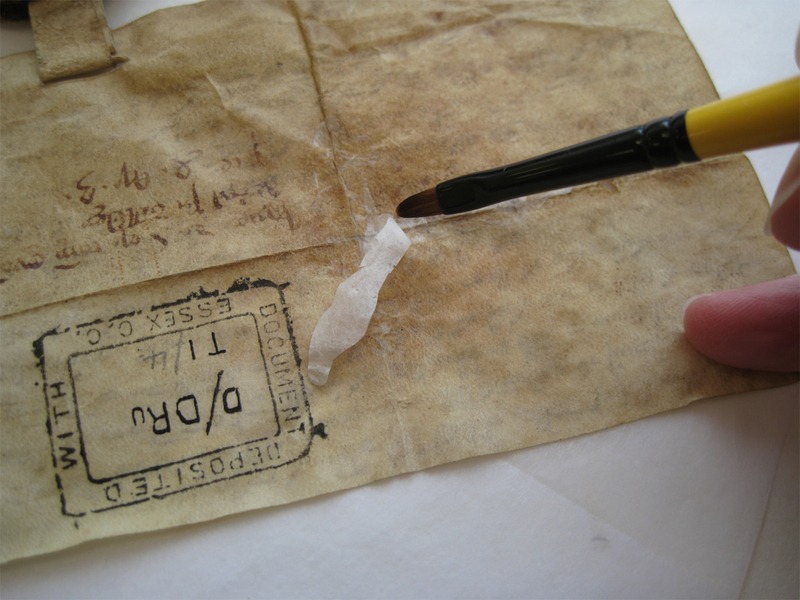 The patches are applied with a tissue backing, which is then removed, leaving an invisible repair. 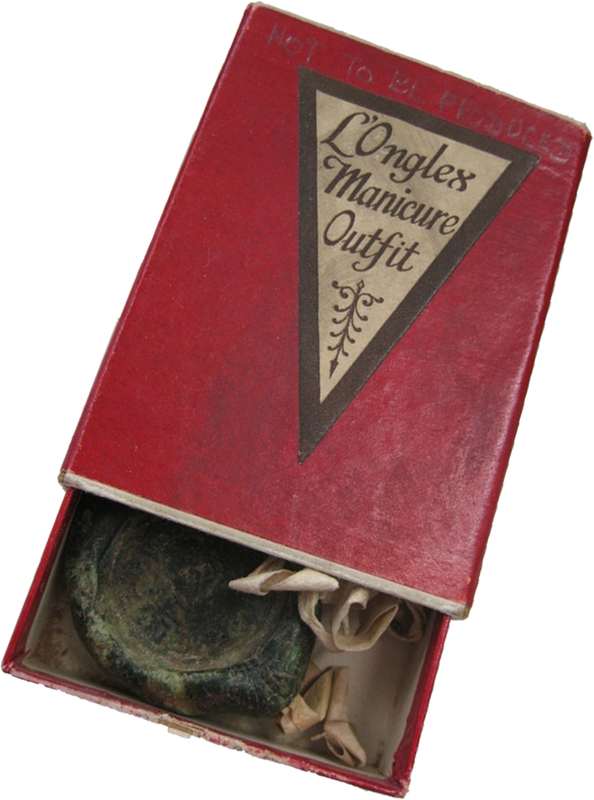 The deeds were stored in cramped and damaging conditions, folded up in acidic envelopes, and even in an old manicure set box. The deeds have now been stored flat, with each being treated to its own custom-made board. A deed in its former storage, folded up in an acidic envelope. Left for long enough the acid in the paper would damage the deed. 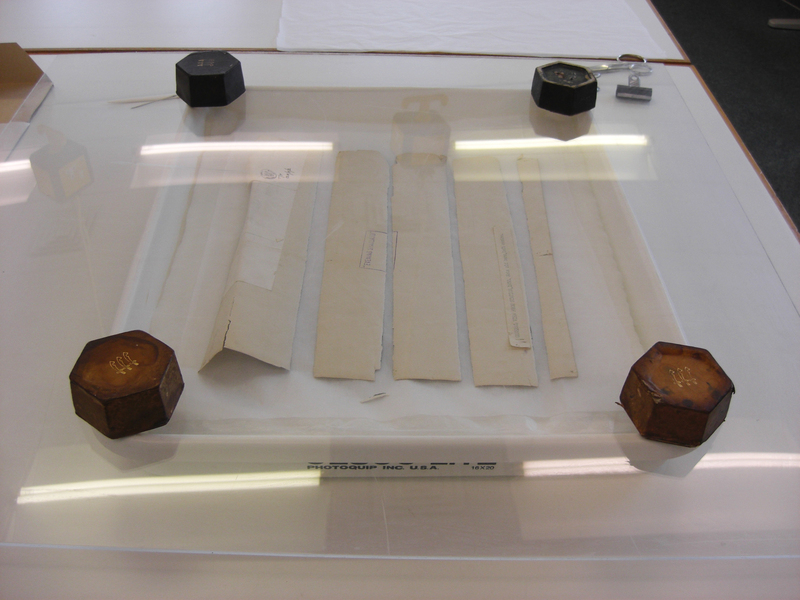 The newly-conserved deeds are on display for the next three months in our brand-new cases in the Searchroom. 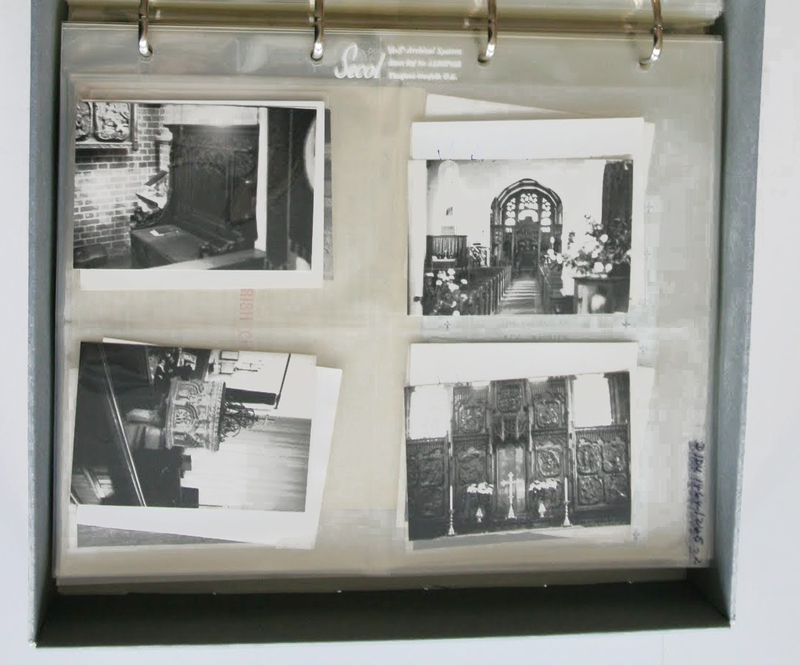 The conservation project was possible thanks to the Newton Bequest, made by Ken Newton, former County Archivist and medieval historian, and his wife Mildred.